For its genre of LDS adventure romance, I'd definitely give this a 4.5 stars if I could. I was lucky enough to get a signed copy of this new novel last month when Rebecca Belliston did a signing in Salt Lake City.Sadie is a beautiful, young woman caught up in a suddenly abusive relationship that she can't seem to leave because of the time she has spent with her boyfriend up to now and the money and influence he has to offer her. Unable to trust anyone, she runs away on a cold snowy night and nearly freezes to death. She is rescued by a group of young men on a ski week together in a cabin nearby. As she gets to know these young men, a romance slowly develops while she also tries to mend her abused spirit. Though I found the ending to be fairly predictable, it didn't change the fact that I enjoyed reading this adventure and had a hard time putting it down. I liked the logic that Belliston used to explain spiritual beliefs in a clear way, and the tension that builds towards the end is pretty exciting. Highly recommended for lovers of romance and LDS fiction. I didn't care much for this book. specifically the main character. I'm sorry, but she's just extremely stupid. And the fact that her stupidity was literally the only thing that allowed the novel to push forward had me actually rooting for bad stuff to happen to her so she could just see the error of her ways and we could all move on. The action was good at the end, but it wasn't enough to salvage the rest of the novel. This story was easy to read, believable, and adorable! I loved the innocent love developed by the four main guys for the very beautiful and relatable main character, Sadie. LDS fiction has never been my favorite genre, in fact I usually steer clear, but I thought this book was spiritually insightful without being preachy. I loved the contrast of the lovely setting with the monstrous ex-boyfriend. I'm excited to read Augustina! Props to Rebecca Belliston for creating a great first novel! Really enjoyed this book! I can't say if I was biased by being a friend of the author (great job Rebecca! ), but I thought it was really well done. The characters were believable, it was easy to read, and the suspense was definitely there. Can't wait to read the sequel. I really enjoyed this book. A great mix of adventure and romance, it’s engaging and unpredictable to the end. The plot was well developed and the characters compelling and believable, which can be hard to find in LDS fiction. I’d love to see more by this author! Fun, fast-paced romance that is full of suspense and great characters. Loved the story! Can't wait to read more from this up-and-coming author. It left me wanting more; so I certainly hope there is another book in the works. Definitely recommend. Sadie is an action packed romance. The book is very compelling and I couldn't put it down. The characters are great. I read it again. It was good the second time also. Not my usual type of book. This was chosen for book club. It was a fun read- very quick. Obviously an LDS author. Kind of shmoopy and cheesy in places, but in a fun way. Overall I enjoyed the read. I stumbled upon this book while browsing. When I realized it was LDS (mormon) fiction I wanted to give it a try because I am LDS and I wanted to see how the author would include that into the story.It was a quick fun read and I think it would be a great book for my daughter to read when she is a teen. It is clean and would bring up lots of topics for conversation with your teen. Like abusive relationships, dating within and outside of the church and moreI have added the sequel to my Amazon wish list. Good summer read that keeps moving. Perfect for a slow August day. Characters weren't complicated, many a bit stereotypical, but she did represent two things quite well: 1) The internal justifications / struggle of one in an abusive relationship who knows it but doesn't see that she ought to leave and 2) The internal struggle of the single Mormon guy who feels like he shouldn't date or fall in love with someone who doesn't share his religious beliefs. I didn’t realize when I started reading this book that it was an LDS fiction book. I don’t normally read LDS fiction books. Usually I look to see what genre a book is before reading it. But I surprising really liked it. Not bad for a first book. The author was a bit long winded and could have gotten the story across in half the words. Still an interesting read. I LOVED this book! It kept me turning pages and I did not want to put it down. The story line was crazy and interesting and intense and the love story was of course cheesy and perfect. I love Sadie! I enjoyed reading this book; it is one that I read in a single day. It fits in a few genres: LDS, YA, and crime thriller.In my opinion, the author excelled at fleshing out the minor characters. Sometimes with books, when multiple characters are introduced at the same time, I have trouble telling them apart and have to flip back to remember who is who, but that did not occur with this novel. Belliston did a great job giving Sam, Josh, Kevin, and Trevor their own personalities and identity. I really enjoyed their friendship as well.I also liked how the love triangle was never really completed. Sadie never realized there was one. I will say though that I really liked the boy she didn't choose. I hope he ends up happy, well, as happy as a fictional character can be. :)I thought the pictures Kevin took of her injuries would surface later in the story as an important detail, but they never did, or if they did, I somehow missed it in my rush to find out what was going to happen next.Even though in hindsight, Sadie made bad decisions, I thought she was a strong heroine.And now for some excerpts. "Now one was going to argue with her now. Not with all the eggshells they were walking on. Six months of marriage and Kevin knew when to talk to a woman and when to just plain shut up. And emotional female outburst were definitely a time for a man to buckle down and shut his trap. ""He left his spot to scrounge up something to eat. He rummaged around and found a bag of chips and a can of Sprite—Sprite! He was getting too old to hang out with a bunch of Mormons. He didn't know how Kevin put up with it. He never complained. ""It had been a long day. She was exhausted. And hungry. She wandered to the freezer and took out a prepackaged meal. It was supposedly healthy, but, as with most foods, healthy usually meant tasteless. She cracked open a corner and doused the chicken with salt and butter flakes. In her mind, those things didn't really count, and she congratulated herself for sticking to her diet. ""Vasquez knew all the laws in America a little to well. He knew how a little red tape and paperwork could bog down an organization like the FBI. It was ironic really. The law that made America great were also the same laws that tied the hands of the authorities from locking up a slime ball like him. Any other country and Vasquez would have been slammed in prison years earlier. ""'You know, you're not a very humble marshmallow roaster. ''Hey, I can't help it. With so few talents, I have to flaunt the ones I have. '""When I was a baby, my dad decided he was done with the whole family thing and took off. I saw him a few times as a kid and less and less after that. Now he's out of my life completely. Crazy thing is, even though he's a jerk, I still miss him sometimes. So maybe we just miss what they could have been. What they should have been. ""She listened a moment in complete amazement. The prelude he played was incredibly difficult, having more sharps than a composer should be allowed to throw on a page, yet he played the monstrous chords effortlessly. ""Sadie laughed, loving that she would never be able to tarnish herself in her mother's eyes." Just the right balance between romance and mystery. I feel like there could be more to the story's ending like a sequel. All ends well and this is a clean read.Sadie, or Angelina thought that all was going right in her world, with a rich, handsome boyfriend (Guillermo) a good job, and a mother who loved her, but all that changed when the FBI showed up at her apartment accusing her boyfriend of being involved in drug trafficking and illegal bribery of high officials in Montana. That wasn't even the worst part, they wanted her help in proving him guilty, but she refused. The FBI agent didn't give up that easily and Agent Dubois slipped a listening device in her purse.When Guillermo hears about the FBI's visit through his surveillance goons, he finds the device and thinks that Sadie has betrayed him. He goes into a rage and physically beats her. When she gains consciousness, she is locked into a room with no shoes or coat. She escapes through a window on the second floor and runs through a blizzard until she finds a unlocked truck as shelter.She is found later that night half frozen and beaten by 4 long time friends on their annual ski trip. Trevor, the flirt and no religious type, sam, the pre-med stanford student, and who is LDS, Josh, the serious, LDS guy who is applying for his MBA, and has a waiting girlfriend back home and then Kevin, the newly married, non LDS guy, who is very observant of others.They take care of sadie, physically as she is slow to warm up to them or trust them as she wakes up in yet another unfamiliar place and isn't sure if the four are friends or are working for Guillermo. They slowly win her trust and after a ranger comes looking for her decide that she must let those she loves and the police know that she is safe. Guillermo after learning of his misjudgment of Sadie sends men to look for her. The FBI is trying to find her too to help with a case against Guillermo after hearing the abuse done to Sadie. She goes back to Guillermo against the guys advice, but had some good conversations with them about God and miracles.Josh finds himself unexpectedly attracted to Sadie and misses her when she is gone, but tries to talk himself out of it because he can have no future with her without a temple marriage. Sadie starts to return the feelings, but is discouraged by Kevin because of religion. When the guys return to Washington after the ski trip, Josh is miserable. He breaks up with Megan his longtime girlfriend because of his guilt for his feelings for Sadie. His misery is noticed by his parents who confront him about his mood. he tells him step mother everything and she interprets his answer to prayer. Feeling miserable after acting on an answer isn't the answer...he goes back after Sadie only to find that she has been missing for 2 days. Guillermo has gotten rid of her for her reporting gun shots and the site of a possible body...the late agent Dubois. Guillermo tries to get rid of her through a cabin fire...she escapes and is brought back to life through a priesthood blessing that converts her and her mother in the end and brings the FBI investigation to an end and josh and Sadie back together for good this time. 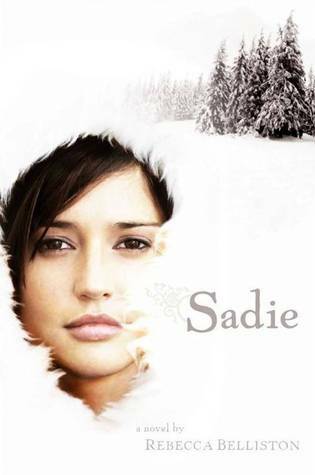 Sadie is on the run from a suddenly violent boyfriend in a snowstorm in Montana near Christmastime. She is rescued by four friends who are staying in a cabin for the break to enjoy an annual ski/snowboard outing. A lot of unexpected things occur during this break--some good, some bad.I thought Sadie was a pretty spunky girl, but she seemed pretty clueless about her boyfriend. I guess it's the typical abusive situation, where she didn't really want to believe this is how he is. I loved the banter of the guys and how they grew so protective of Sadie in such a short amount of time. I could relate to Josh's dilemma and thought how he handled it was good. The ending was a little abrupt for me--I wanted things a little more wrapped up.Content: some violence and intense situations, but not too graphic. I've been excited to read this book for several months now...and it didn't disappoint! Sadie is a girl who seems to have it all (handsome, multi-million dollar boyfriend, popularity, beauty), but within the first few pages, her glitzy life unravels. She is beaten by her boyfriend and locked up when he thinks she has betrayed him; escaping out a window, she flees for her life and is found half dead and frozen by 4 young men on a ski trip for Christmas break. This story was gripping and held my interest to the end as Sadie struggles to decide whether to go back to the abusive boyfriend or not--and her new friends strive to talk sense into her head. The characters, especially Sadie and Josh, were amazing. The subject of victims of domestic abuse is a big theme in this book, but it wasn't too graphic or depressing. Great read! I got this book from a very dear friend as a Christmas present. I have not read an LDS romance in YEARS so I had to keep reminding myself that this is how 'those books' are. Meaning there is a lot of things in here that unless you are LDS you just won't get or understand. I wish it would have been written more in a way that would cross over to others. I enjoyed the writing, was intrigued by the story, and thought the romance was cute. There were a few things that were a bit out there for me to grasp, but I still enjoyed the whole story. I did wish that this book answered more questions, and didn't leave it as a cliff hanger for another book. Personally, I'm getting tired of trilogies. I want a book that starts, has a middle, and a REAL ending. Sadie is about a girl who is beaten by her boyfriend. As she runs from her boyfriend, she passes out while trying to find. Sooner or later a group of men, who were on a trip, found her. They took her into their care, and began to build a friendship with her. As the book continues Sadie begins to have a certain interest in one of the men and finds herself in love. This book wasn't made into a movie.I would most defiantly recommend this to book to anyone, mostly to young adults as well as older adults. It was an amazing book, which really showed how a complete stranger can become someone very important to you. It was a very well written book that gave a very interesting plot. If i could change anything it would be to make a second book for a series. This is a beautifully woven story of a young woman in search of truth and a meaningful life. Sadie is torn between what she thought her life was going to be, a life of opulence and adoration, and what her heart really wants, a life of true love and devotion. Through horrific circumstances, she finally learns that the former life was just an illusion and that the truth is borne by her one true love. This is one of those stories that absorbs you from the beginning, making you know and love the characters (and making you hate some), keeping you up reading until the wee hours of the morning. It is a story I can't quit thinking about. I'm so looking forward to a sequel to find out what Sadie's future has in store for her! About the first third of the book was so...bad...that I kept wanting to quit reading. I couldn't believe Goodreads had lead me astray with its overall rating for this book. At about 4:30 am (I had a bout of insomnia), I was too tired to get another book so kept reading and ultimately finished the book. I would rate about the first half of the book one star--no question about it--I disliked it that much. About the last fourth of the book, I would rate as five stars (and where I think the goodreads rating must come from). If "the same person who wrote the ending" had also written the rest of the book, it would be an awesome story. I enjoyed this book although I found the character of Sadie to be a little annoying. (Spoiler)I was mostly annoyed with the fact that she refused to talk to the FBI. I understand that one of the FBI agents was a mole but she didn't know that until the end and it just seemed like any normal rational person wouldn't be so antagonistic towards law enforcement unless they had something to hide. I did like the plot. I liked the budding relationship between Sadie and Josh throughout the whole book. I will for sure read the sequel. Overall I enjoyed it and would recommend it to others. I don't usually give 5 stars, but I really loved this book. I am shocked this is Belliston's first novel. It was great! I loved the characters, the story moved fast, and never lagged. The romance was sweet, and clean. And I loved the LDS parts, that weren't preachy, or over done. Great book! I'd let my teen daughter read it. I picked this up at Deseret Book on a whim, and I'm so glad I did! I'd love to read more by this author, and I can't wait to share this one with others! Sadie Is accused of betraying her boyfriend, and when she tries to flee, right into a snowstorm, she wakes up to 4 guys, wondering if they are trying to help her or hold her hostage. Fun story! What would you do if the FBI was after your boyfriend, and you believed he was innocent? What would you do after your boyfriend beat you up in a fit of rage because he found a listening device in your purse? What would you do after you were found by 4 guys on a skiing trip, and the FBI is still after you? That is the pickle that Sadie finds herself in. As she comes to terms with the fact that maybe her boyfriend is not all she thought he was, she must also deal with growing feelings for one of the guys who saved her, as well as her own suspicions that the FBI has a leak. This clean LDS romance/mystery is about Augustina/Sadie who has a very rich boyfriend. When he thinks she is working with the FBI against him, he beats her up and locks her in her room. She escapes and is found by four college-age men who are staying at a cabin and having a skiing holiday over Christmas break. After a few days, Sadie goes back to her boyfriend. Although the reader guesses he is a criminal, the book keeps you guessing. I enjoyed the book, although I was kind of upset about the non-ending. Guess I'll have to find the next one in the series--and hope it ends. This is one of the better LDS fiction stories I've read. The writing is surprisingly well done, not cheesy or cringe worthy in most places. The love story is believable, albeit fast. It didn't wrap up too quickly and kept the book going to an actual end. I will say this is not really a suspenseful novel, it's a romance with some slight twists thrown in. So if you're going in thinking this is a mystery with romance, reverse it and you have the right idea. I'm interested to see what else Belliston comes out with, I enjoy her writing style. When I started reading this book, I was nervous for several reasons. I've never read any LDS fiction before and I was worried about it being preachy or weird. I was also a little worried because I know the author. However, I worried needlessly! I thought it was very interesting to read a book where some of the main characters are LDS. I really appreciated reading about these characters who I have something in common with that is so close to my heart. I also just really liked the story. It was exciting and, at times, upsetting. I really want to see what happens next.